On Monday, the stock market will take the day off to shake the confetti out of its hair. But on Tuesday, it'll be back to business as usual on Wall Street. Here are some of the items that will shape the first trading week of the new year. 1. Slow Time at the Apollo: Online education has been an attractive option for high school graduates looking to beef up their resumes without having to fork over big bucks and several years to attend traditional colleges and universities. The industry has come under fire over the past two years for the lousy repayment rates on student loans and the way that some bad actors aggressively market their degree programs. We'll get a decent snapshot of this once-recession-resilient industry when Apollo Group (APOL) reports on Thursday. Analysts see the company behind the University of Phoenix posting its fourth consecutive quarter of year-over-year declines in profitability. Despite posting failing grades on the bottom line over the past year, shares of Apollo are trading near fresh 52-week highs. However, the stock is still trading roughly 40% below its all-time high set nearly three years ago. 2. Shipping FedEx on the Rise: A lot of things, including tablets and video game systems, continue to get cheaper, but that doesn't mean that the costs of getting these gadgets to your front door are getting any lower. FedEx (FDX) is raising rates this week on many of its more popular shipping options. We're looking at an average hike of nearly 6% for FedEx Express package and freight rates. 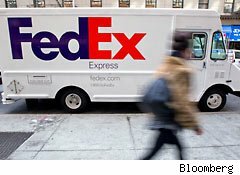 A similar increase goes into effect on FedEx Ground and Home Delivery services. It remains to be seen what kind of impact this will have on online retailers that have been pushing free shipping as an incentive to keep shoppers from abandoning virtual shopping carts. The obvious solution would be for them to increase prices on their merchandise to offset the higher fulfillment costs, but that may get in the way of filling up those virtual shopping carts in the first place. 3. America Goes for Cheaper Grub: Ruby Tuesday (RT) and Sonic (SONC) are two of the companies reporting their quarterly results this week. Both eateries are expected to post softer bottom-line results than they did a year earlier, with Ruby Tuesday checking in with an actual quarterly loss. Maybe you've been to one of Ruby Tuesday's casual dining restaurants. Maybe you've parked in front of an ordering board at a Sonic to have a carhop deliver your burger and shake. Neither company can truly be considered a bellwether, though. There are far larger and more popular table-service chains than Ruby Tuesday. And an empty Sonic doesn't mean that there's not a long queue of cars snaking through Mickey D's drive-through a couple of blocks away. In short, disappointing results out of the two industry laggards won't be indicative of dining-out trends in general. 4. Fields of Dreams: Monsanto (MON) and Mosaic (MOS), two agribusiness heavyweights, are also reporting later this week. Monsanto is the agrichemical company behind the Roundup weed killer that helps gardeners keep their lawns thriving. It arms farmers with corn, soybean, cotton, wheat, canola, sorghum, and sugarcane seeds. Mosaic steps up once the crops have been planted, offering up the phosphate- and potash-based products used in fertilizing the fields. Unlike Ruby Tuesday and Sonic, Monsanto and Mosaic are relevant enough within their niches to provide a healthy snapshot of the state of global agriculture. It's probably a good thing, then, that analysts see both companies posting sharply higher profitability this week. 5. Hurd Mentality: The final week of 2011 ended with a bang for the seemingly dead Mark Hurd saga at Hewlett-Packard (HPQ). The former HP CEO lost an appeal before a Delaware court in which he sought to keep confidential a letter that contained allegations of sexual harassment, and the letter began circulating last Thursday night. Hurd isn't at HP anymore. He was dismissed during the rocky summer of 2010 when the incident initially surfaced. He's now a high-ranking executive at Oracle (ORCL). Given HP's calamitous state since his departure, history has redeemed Hurd's performance while trying to turn the PC and printing giant around. Will this letter change things? The embarrassing accusations aren't necessarily true. In fact, the letter itself was recanted after a settlement was reached with the accuser. Yes, we all know how it looks when someone with sexual harassment claims gets paid off. However, the real issue as we head into 2012 will be whether this is something that Hurd may need to address in the coming days if he wants to restore his public opinion. Yes, even the nerdy tech world has its soap operas. Longtime Motley Fool contributor Rick Munarriz does not owns shares in any of the stocks in this article, except for HP. The Motley Fool owns shares of Oracle and FedEx. Motley Fool newsletter services have recommended buying shares of FedEx. Motley Fool newsletter services have recommended creating a synthetic long position in Monsanto.